The former shrine name was Kumano-jinja, but in the 1863 publication “42 Ura Narabini Douchuki”, it is named as ‘Rokusha Daimyoujin’. In the ‘Unyoushi’, it is ‘Rokusha Myoujin’ with Izanagi-no-mikoto, Izanami-no-mikoto, Amaterasu Ookami, Ninigi-no-mikoto, Susanoo-no-mikoto, Koyane-no-mikoto being the six enshrined deities. Kumano may probably be the name used in the time period during which religious rites were limited to just Izanagi-no-mikoto and Izanami-no-mikoto. The Unyoushi notes reference in the Fudoki to a ‘Mitsu Yashiro’ shrine. This is surely the same Mitsu Jinja as is present today. Omura Washiro Shigeyoshi, who worshipped at this shrine in 1866, wrote about it in his pilgrimage diary using the name ‘Rokusha Daimyoujin’, this can be hypothesized as being ‘Mitsu-Yashiro’. 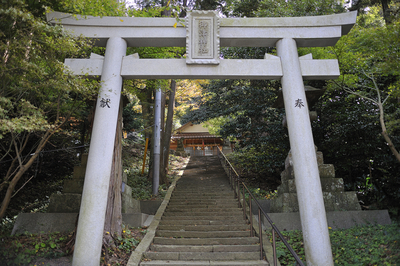 The ‘Mitsu Yashiro’ seen in the Izumo Fudoki is one of the ‘Shikinaisha’ official shrines. Its entry includes the information ‘Mitsu no Hama: 1,144 feet wide. Mitsushima Island, wakame (seaweed) grows there’ This ‘Mitsu’ is considered to be a guardian kami for the area. This shrine seems to have witnessed numerous location transitions. 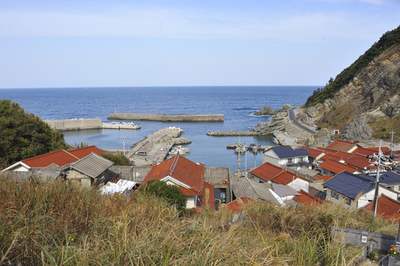 These phases can be seen in the Unyoushi which referred to it by its earliest shrine name ‘Honchisha’. The chief representative of Mitsu-jinja pointed out that on the subject of ‘Uppurui nori’, the Izumo Fudoki notes ‘…seaweed is found in the locations Mishima, Noroshi Shima and Kozu Shima ….but naturally Tatenui Province seaweed surpasses all’. Having assumed that Uppurui Nori was something only available in Uppurui Bay, this information is quite surprising. The discussion continued by adding that seaweed collection at Mitsu-ura, like that of Uppurui, carried a high risk due to the choppy, violent seas. The Shinto rituals held at Mitsu-jinja today are exactly as described in the ‘Unyoushi’, compiled during the Edo Period; the ‘Taue-shinji’ (rice planting ritual) and the ‘Omato-shinji (archery ritual) held every January 7th. The ‘Kyoudoshisaka’ (local history records) describes the Omato-shinji thus: Shinto Priests fire arrows at a board made of Japanese cedar on which the word ‘Oni’ (Demon) is written in cinders. The Taue-shinji involves leaves from black and red pine along with rice plant seeds being planted. The Shinto priest declares the hope for an ‘imminent bumper harvest’. Worshippers from the central shrine building do mochimaki (rice cake throwing) marking the end of the ritual. The ‘Omato-shinji’ represents a legend still told today regarding the kami firing arrows which scared away the Mongolians during their invasion of Japan. On January 7th 2013, in Shimane-ken, Noha-ura, at Hinomisaki-jinja a related ‘Otaue-sai’( harvest festival) took place. This event attended by all ages from babies up to the elderly was a lively occasion with the participants energetically swinging their rice cakes held between bamboo sticks down towards the rice sapling. Incidentally, there is also a Mitsu-jinja in Kashima-cho, Matsue-shi but this has no connection to this shrine in Mitsu-ura.